Time was when introducing older people to the potential of the online world – in official pursuit of digital inclusion – meant a computer, trainer, and possibly a bit of a struggle with the mouse. Now we are beginning to see a less formal approach: tea, toast and tablets. I think it is likely to be more successful. Here’s why. I was recently delighted, and intrigued, to be copied into an email from Myra Newman thanking people for their support for a London event run at the Central & Cecil Sheltered Housing scheme, together with Primrose Hill Neighbours Help (PHNH). Some of the residents were amazed you could use an app to find out the next bus, or book tickets to the ballet. And even Skype. The impact it can have using a tablet, instead of a computer – that seems pretty daunting and locked away in another room, is far greater. At the `Wealth of the Web’ conference in January, David Wilcox and Professor Leela Damodaran offered encouragement to run a digital inclusion event. Without them, the `Tea, Toast and T’Internet’ session might not have happened. Myra was referring to the workshop Drew Mackie and I ran in January with Age UK London, where some 50 people invented a set of fictitious characters, told their life stories, and played through in groups how the online world could help them meet life challenges they faced, and explore new opportunities. There wasn’t a screen in sight, because we were making the point that the best way to engage people was to start with their interests, not with the technology, and have some fun. I may have mentioned the idea of iPad tea parties. Since then I’ve been making rather slow progress in gaining official support for further events … but meanwhile Myra and friends have just gone ahead and done something more interesting. I rang Myra to find out how … and discovered the importance of long-standing relationships, volunteers with professional skills, combined with personal determination. Primrose Hill Neighbourhood Help manages a volunteer befriending service for isolated older women and men, and also runs information sessions at a Central & Cecil Sheltered Housing Scheme. Digital Inclusion Officer Nathaniel Spagni recently installed WIFI in the lounge. There are computer drop-in sessions at the centre. Lee, a social media champion from Age UK London ably assisted PHNH with an eye-catching flyer, `Tea, Toast and T’internet’ and helped on the day of the event. The flyer was posted on the main noticeboard at the Centre and residents signed up. Tea and refreshments were prepared and served by a public-spirited resident who took charge. Myra was for 32 years a Camden librarian, and is well connected with many local groups and networks. With support from Richard Higgins, C&C Centre Manager and confident of the interest of a few residents in having a tablet demo, she made a call to Breezie, who are working with Age UK to market customised Samsung tablets. Breezie provide a service that makes it really easy to set up the tablet, and add more apps as people’s confidence grows. 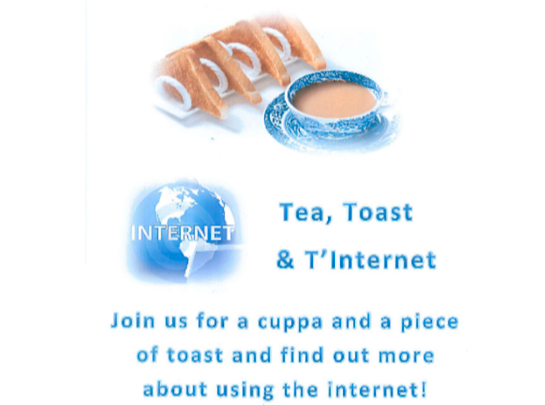 I was bowled over by the number of residents who voluntarily joined us for a cuppa and a piece of toast to find out more about using the internet. The Breezie team guided residents through the steps and along with a cuppa, the `hands-on’ experience was a positive one. For many, the wonders of this new phenomenon was a light-bulb moment. I was never interested in learning about computers and always thought I’d stick with pen and paper but the demo of tablets has changed my mind. I’m now hooked on the idea of having a tablet. I was impressed with the enthusiastic people who guided us on a 1-1 basis on how to use tablets. Sounds like making a fresh, new start as I don’t get on well with my computer. I’m particularly interested in being on the internet and encouraged by the fact that Email will already be set up on Breezie and that unlimited support is offered for 12 months. That Device Company, who are behind the project, aim to donate £50,000 to Age UK during 2014 through promotion and sales. On the day Breezie CEO Jeh Kazimi turned up with a team of volunteers, and six tablets. These run on the Android system, which out-of-the box can be more difficult than Apple iPads – but the virtue of the Breezie is that it provides a simplified set-up that can be tailored to individual use. I think it would be really interesting to arrange a session with iPads for comparison. My hunch is there will be pros and cons on each. Jeh has written about how Breezie was born from the challenge of helping his mother, on a visit to London, to use Skype to connect with her husband in India. My wife and I helped her by sticking post-it notes all over the computer screen. Sounds odd but, for mum, it meant that she paid attention only to the parts of the screen she needed to, and ignored any extraneous information and clutter. From this, an idea formed: why can’t technology become more human, rather than humans having to adapt? 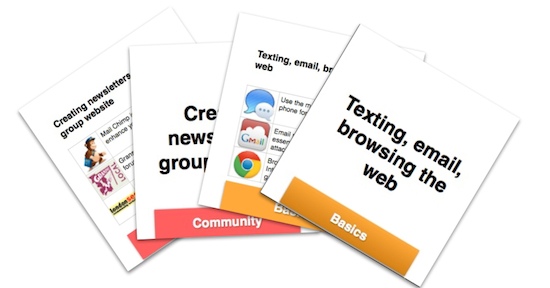 The need for apps that can be used by those with little or no technological nous – and there are still more than 6 million UK adults aged 55+ who’ve never used the internet before – and the need to deliver it without patronising or limiting them, was clear. Tablets are key to solving the problem of digital isolation. While most of us can use a mouse as easily as we can put our shoes and socks on, it’s not that easy for everyone. It’s very difficult for the rest of us to imagine but desktop computers can seem intimidating to those alien to technology. Tablets, however, are portable, unobtrusive and the touchscreen designed to be intuitive – a good starting point for those who’ve never used technology. The next hurdle was to work out how to deliver this to the digitally isolated. It was a fabulous event. 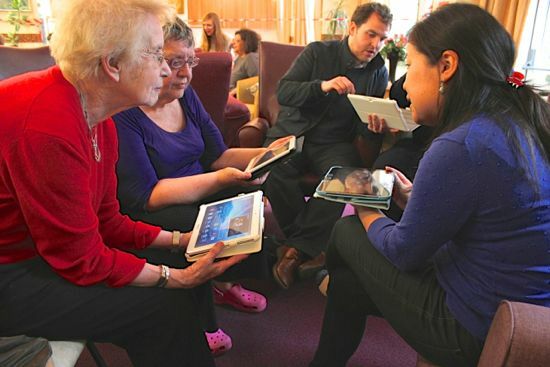 Having spent some time helping older people on laptops and desktop computers before, I was quite astounded at how quickly some of them picked up using a touchscreen tablet in comparison. It was pretty impressive really! So well done you and the other PHNHers for all your amazing effort in pulling the afternoon together – otherwise those folks would never have had a chance to have a go on such technology and would have remained intimidated by it. Now many of them are intrigued and excited by it and have begun to think how it might be useful to them, which is a much more positive place to be. 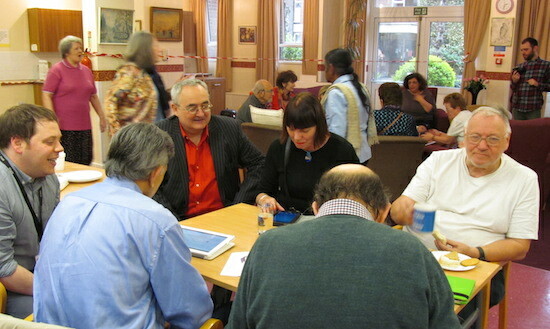 The tea and cake certainly helped too – a lovely vibe in the lounge that afternoon. Looking forward to the next one! Laura then blogged a piece with the promise of a further event. Congratulations to Myra Newman, Primrose Hill Neighbourhood Help Information Desk and everybody involved in making the afternoon such a success. It was an honour to be there and great to be able to help in a practical way. I think many older people wish to embrace new technology for the way in which it can tackle isolation. For example, my late Mother lived abroad but was able to keep in contact with her wider family through email and skype. Others are able to use the internet for shopping, watching films, social networking or just browsing. It’s important to ensure that older people are including in the digital revolution, which is transforming all of our lives. I hope we can find a way of sourcing some kit to extend this. It really is a great idea, which will help tackle isolation amongst older people living alone. 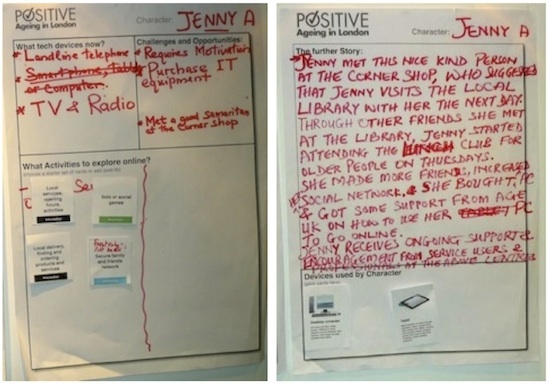 As part of my role at Age UK London I work with older people on a variety of digital skills through our Fit 4 Purpose workshops. At Jacqueline House I spent around half an hour with James Nelson, one of the residents. James had a desktop PC that a friend helped him use due to poor eyesight. He’d never used a tablet before. 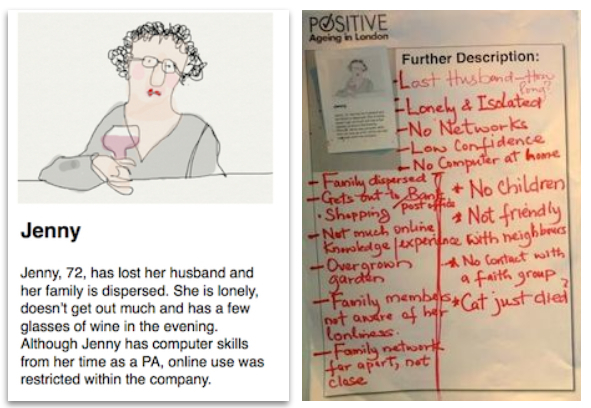 At Age UK London we believe that anything can be used as a motivator to get online. James and I looked at a supermarket website and I showed him how you can order groceries online – he was interested in that, but it wasn’t enough. I then asked him who he supported. “Chelsea.” I asked, “What’s your favourite Chelsea moment?” Without hesitation James told me it was the 1970 FA Cup Final replay at Old Trafford. He was there, and saw his team lift the trophy. Within seconds I was on YouTube and James was reliving that day… and he really was reliving it! When Leeds scored he told me, “They went 1-0 up, but they don’t win.” James cheered when Chelsea scored and told me he thought it was ‘amazing’. James had seen the endless possibilities of being online… football is a great motivator! Lots of important messages are expressed in a compelling way in your report. One additional critical point that needs to be highlighted is the importance of the on-going support that follows after the experience of Tea, Toast and T’internet is over and the new ‘convert’ finds him/herself alone with the device. In other words, a technological device alone – whether a tablet or anything else – cannot by itself solve digital and social exclusion. The value of 12 months unlimited support offered with Breezie should not be underestimated for the confidence and sense of security it promotes – especially among new users. (Clarification from Age UK and ‘That Device’ on how users’ interests will be safeguarded and their support needs met once the 12 months has passed should be sought as a matter of some urgency before widespread promotion of the Breezie proceeds). 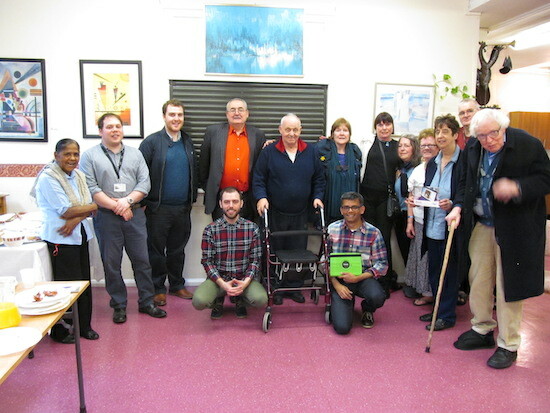 It is also the case that the leadership and commitment of Myra and her colleagues, the support from local government, from a member of parliament and from a community such as Primrose Hill Neighbours Help (PHNH) were crucial achieving such an empowering experience for the older participants involved. All these factors working in combination are crucial to the promotion of successful digital participation of older people. It will be important that documented reports of the process make very clear that far more is involved than simply handing out technological devices! I’ve added rather more quotes than I usually might to a post because it seems to me the secret of success on this sort of occasion is the connections between people in the area who may not have technology as their main passion, but who see the potential and will support someone like Myra with an experiment. They are the real champions … who may become digital champions and provide support in the longer term. I should add that the party idea isn’t new: Age UK, and Age UK London have run Techy Tea parties, some of them supported by EE. Digital Unite, who organise the annual Spring Online programme, are also promoting the idea, and I should think we’ll see lots more next year. (see update below). What seems particularly promising is the combination of local volunteer action with a consumer product to complement the more traditional digital inclusion programmes. Update: as I was finalising this post, I spotted that the mobile network operator and Internet Service Provider EE have won a Big Society Award for running 68 Techy Tea Parties during 2013, with over 565 staff voluteers. David Cameron is quoted as saying: “Whether it’s creating an email account to connect with friends and family, or learning how to use an iPad, EE’s ‘Techy Tea Parties’ are demystifying technology and giving people the skills to get online”. Olaf Swantee, EE CEO, says they will bring Techy Tea Parties to every store, office and contact centre across the UK this year – so maybe there’s scope for more local partnerships. The big question, of course, is whether people will buy – or be able to afford to buy – a tablet and mobile Internet connection after the party. I’ll follow up on that in a later post. Meanwhile, cheers all round.